Our potting shed is constructed to a high quality using 2”x 1½” planed framing, clad in 12 mm Tongue & groove shiplap, features 12 mm Tongue & groove roof & 12 mm Tongue & groove floor boards. You get an opening window and front staging as standard. 4 mm Toughened glass is also included at no extra charge. (front glass only) Full door is standard but you may have a stable door as an optional extra. All fittings are galvanised. Wall Sections are screwed together. 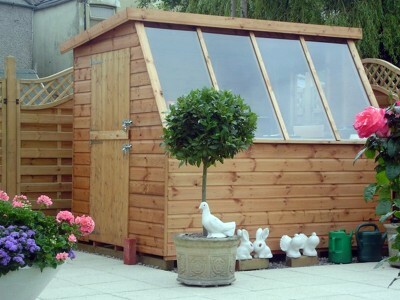 All our garden buildings are fully treated with a finished coat of solvent based treatment prior to delivery. This building is an asset to any garden all year round. Sizes range from 6'x6' to a 12'x8'.